We may already be a week into 2010, but that doesn’t mean it’s too late to starting making resolutions. Resolve to give your online marketing efforts a boost this year by recognizing areas for improvement and putting in place a plan to make positive changes. To help you get started, TopRank Online Marketing has come up with New Year’s resolutions for 5 different online marketing channels: Search Engine Optimization (SEO), Social Media, Email Marketing, Pay-Per-Click and Mobile Marketing. I resolve to focus more on maximizing visits and conversions from organic searches. With SEO efforts, it’s easy to get caught up in one goal: getting found via the search engines. But ranking in the search results is only half the story. If potential customers aren’t clicking through to your web page – or other piece of digital content – the ranking doesn’t mean much. Plus, due to variances in what each of us sees in the search results for the same query, rankings as metric are no longer as useful. Personalized search results according to location and web history means your site might rank high for one person, but not another. What competitive search results are your potential customers seeing? Assess the title tags and meta descriptions of competitive search results. Are competitors offering customers a free case study or a complimentary product sample? Then consider ways to make your own title tags and meta descriptions out-entice the competition. Does your content live up to the promise put forth in your title tags and meta descriptions? Put yourself in your customers’ shoes: When you first visit your web page or other digital content from an organic search, is the content you find relevant? Potential customers don’t want surprises; they want a solution to the problem that caused them to search in the first place. And they want it as promised. Not only will searchers respond more favorably to customer optimized titles and meta descriptions, but the increase in clickthroughs will, no doubt, be noticed by search engines and may influence subsequent rankings. I resolve to set goals and track the results of my social media efforts. There’s no denying that social media is more difficult to justify in terms of ROI compared to other online marketing strategies. But that’s not to say it’s impossible – or that tracking results should be placed on the back burner. And without goals, it’s pretty difficult to measure success. In 2010, put forth even more effort to set goals for social media participation and tie results back to specific tactics. There are a host of free or near-free tools available to gauge brand mentions and traffic from social media channels. In December, we highlighted 5 of these social media monitoring tools. Without setting specific goals upfront, social media efforts can’t be definitively quantified so be sure to implement a Social Media Roadmap and all or social bases will be covered. I resolve to integrate my email marketing with other online marketing channels. Regardless of what the naysayers may say, email marketing isn’t going to disappear as a result of social media in 2010. In fact, email will continue to play a significant role in most online marketing mixes this year. A study from Silverpop found nearly half of marketers surveyed plan to increase email marketing budgets in 2010. That’s not to say email marketing efforts shouldn’t evolve with the times. Integrating email with social media is on par to be a popular resolution for 2010: A recent eMarketer report found 40% of executives surveyed will make integrating the two tactics their top marketing initiative this year. Another 25% of respondents have already implemented an integrated strategy. Pledge to take email marketing to the next level by encouraging email subscribers to not only forward content via email, but also to get social with email and share it via Facebook, Twitter, Digg and other sites. Conversely, conduct a poll on Twitter or your blog, and encourage followers and readers to subscribe to your e-newsletter for the results. I resolve to maximize conversion rates by testing different versions of my ads and landing pages. Most companies using self-serve pay per click programs fall victim to “set it and forget it” habits. They’re busy with numerous other marketing activities or don’t have the time to really get to know the native bid management platforms and test/refine campaigns. Even if PPC efforts are reaching set goals in terms of conversion rates, there’s always room for improvement. You’ll never know until you try. Test multiple ad versions that highlight different benefits of your product, service or company. For example, one could tout cost-savings benefits, while another emphasizes a convenience aspect. Use A/B testing to try out two different headlines on your landing page. Again, each could speak to a different benefit (i.e., cost savings vs. convenience). Google Optimizer is a great tool for this. If you’re targeting a competitive search term with many competing ads, consider launching two different campaigns simultaneously. Each could offer a distinct piece of fulfillment – a free case study and a product coupon, for example. I resolve to rethink my website design for mobile users. If your site isn’t already optimized for handheld devices such as cell phones, now is the perfect time to re-assess your site design and how users find your site through mobile search – particularly for B2C companies. In October, ABI Research forecast that mobile sales of physical goods in North America would reach $750 million by the end of 2009, a 117% annual growth rate. Consumers are doing a lot more than purchasing downloadable cell phone ringtones and games from their mobile devices. These days, clothing, electronics, books and a host of other items are being purchased through mobile commerce. Additionally, social network participation through services like foursquare, Facebook and Twitter are growing dramatically, creating additional opportunities for promotion and traffic to the mobile version of your company web site. As you make your own personal New Year’s resolutions to drop a few pounds, start a savings account or join a gym, don’t forget your online marketing efforts. Each year provides a fresh start and endless possibilities, so take advantage. 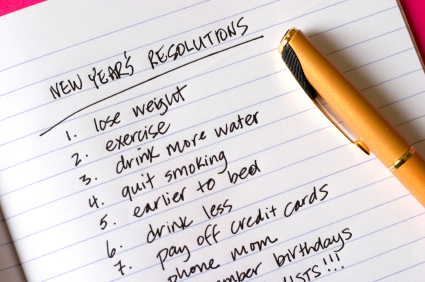 What resolutions do you plan to make in 2010 to improve your online marketing efforts? Good thoughts especially the Mobile rethink of website. I like this post. very nice. I am especially found of your social media roadmap. Excellent list! But consider making Social Media your #1 priority this year, the year that Social Media goes truly mainstream! I love this piece… PPC & Email marketing has been a challenge for me but I completely agree with resolution 1 & 2. Thanks. I’d love to read more detailed articles on how to make your website mobile friendly. I liked your tips but other than that all I I know is that it’s big and important but at this point haven’t investigated if there are specific things that need to be done for mobile website usability. I am a reasonably new blogger, so for me this is a great list of things I can be doing in 2010. Wonderful points! I might add that you reevaluate your market. Clearly defining your market will increase your efficiency in all of these areas. I have found surveys to be a very useful tool in determining my market as well as what what my market wants. Big time savers! Now I think they're all inter-related as you post suggests, and the SEO should be more prominent… but these are the folks with the budget. Go see more demographics there. You have a lot of great resolutions that i need to follow. Thanks for sharing! The PPC one is hard for me. I have found it to be not nearly as effective as organic ranking (which is free, but very slow) and I find it so time consuming, expensive and tedious, that I just get bored with it. I would rather spend my time creating content and networking which has always done well for me. I would add to that list – maximize your newsletter list. I doubled my income last year just by focusing on the list I had already grown and how to best serve that list. I was pretty surprised. Wonderful information! I Really…. Today in the modern world Internet marketing is one of the great ways to promote your website and you’re aware of the importance of it, and now you need to start optimizing your site. We study search demand/supply trends from around the world to find profitable niches and products, and the main problem with predictions is that no one looks at the “supply” side to these predictions. A niche, or hot predictions, is not just a demand side issue, but a supply/demand curve. If you predict IPHONE apps will take off, and there are already 100,000 aps, then you aren’t going to hit that one. If you see that demand for cell phone radiation shields is going nuts and there are only two suppliers, then you can be pretty sure that it will be a good year for those 2 supplies. This is a great list of things to do for 2010. I am going to be concentrating on all but one of these and that is going to PPC, as I am going to focus on getting visits and conversions from the organic searches. Good blog post! I'm a neat freak so organizing plans according to different projects is a MUST! Nice way to lay it out! Great post. I cant wait to see what this year will hold in the digital universe. This is nice to read your post over marketing.. great information all tips are appreciated thanks. A recent white paper published by Tetherball discusses ways to measure how the effectiveness of mobile marketing, even when customers do not perform the desired action step immediately. The resource is available at http://www.tetherball360.com/analytics/. That link isn't to the actual report but a landing page. We prefer direct links, thanks. You can find different techniques to achieve higher ranking in the search results but SEO is the basic fundamental tool where every webmaster should implement them to achieve better search engine ranking. PPC, SEO, email marketing , social networking are the best internet marketing business. I totally agree with all of the Tips. I have been using Article Marketing and Press Release Marketing as a part of my Mix and the results have been great. It is all about trying a number of thing and stick with what works. Video Marketing is another method that works quite well too. Thanks for the incentives. I am going to be testing these ideas at my site The Online Money Test. So far I am working on SEO but want to start email marketing and pehaps PPC soon. I will be publishing my results on my site every week as of next week.